When to Use an Agency | Socialed Inc. If you’ve ever been in a position where you’ve had to choose between hiring an employee or hiring an agency, to do something in-house or to outsource it to a third-party, then you should probably read this blog post. Why? Well, partially because I want your eye-balls and attention (and your validation via comments and Likes, and the like). But mostly because when it comes to choosing whether to outsource a project or deliverable, or not, it’s a question of costs, and I’m about to tell you how to do a cost-benefit analysis that takes into account more than just the line-items in your budget or expenses. Basically, the costs of doing business transcend the checks you write. Depending on the project, deliverable, or resource you’re looking considering, there are often other, hidden costs, and you have to take these into account if you want to make the right choice for your business. And there are couple questions you should be asking if you want to uncover some of those hidden costs. Is it part of your core business? The first question you need to be asking yourself is whether the project/deliverable/resource you’re considering is part of your core business. If it’s not, trying to develop the necessary resources in-house can be a complete distraction and diversion of resources from your actual business, and end up hurting your growth and/or your bottom line a lot more than you think. For instance, most businesses require office or retail space, but that doesn’t mean they build it themselves. Rather, they rent real estate from a real estate company because they don’t have the expertise to build or manage brick and mortar space. The same reasoning can be applied to any other project/deliverable you’re considering. If you’re a small ecommerce store with only a few dozen SKUs, for example, then you’re probably more of an online retail company than a technology one, so it probably makes a lot more sense to outsource a lot of your web development needs and IT infrastructure than to build up internally. Amazon, on the other hand, has a couple hundred million SKUs, and deals with such a staggering volume of traffic that it is a technology company, because any amount of downtime can mean millions of dollars in lost revenue. For that reason, it does make sense for them to maintain the infrastructure and engineering support staff that it does. Where the line between something that is part of your core business and something that isn’t can be murky, and that’s up to you to decide. But it’s certainly something you should be considering before deciding whether to actually invest in developing the resources in-house, because doing so can end up changing your core business model in (undesirable) ways you did not anticipate. Another thing you need to consider is what you will not be able to get done while you’re working on a project in-house. 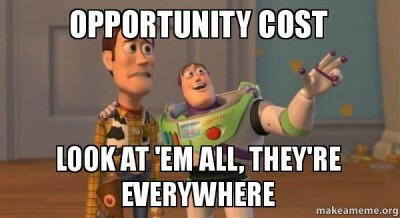 In other words, what would be the opportunity costs? 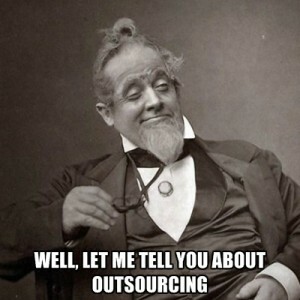 For instance, even if something is routine, it often doesn’t make sense to divert resources to getting something done when you can simply outsource it to someone who specializes in it. For example, at the Brendan & Brendan office where I rent desk space, we used to have a rotating cleaning schedule where two team members would take a couple hours every Friday to tidy up the office. Not only was this a bit of inconvenience for whoever was scheduled on any given week, but the combined 3-4 hours those team members were spending on cleaning would’ve been better spent on getting things done. What we ended up doing was hiring one of my clients, Montreal Office Maintenance, to come in once a week to handle the cleaning, because even though this was an extra expense for the business, the revenue that could be generated in those extra 3-4 hours of productivity every week more than offset the cost of using a janitorial service provider. Similarly, if a very urgent project or deliverable comes up, it could really disrupt your business or productivity to pause other operations to divert resources to doing it in-house. If that’s the case, you might want to consider using your agency or a freelancer to handle that overflow while you focus on keeping the other parts of your business running at full capacity. Whenever you’re making a business decision, it’s important to remember that counting beans is not the same as looking at the bottom line. If you’re really going to be strategic or proactive (or whatever) with how you choose to spend money, you have to look beyond the decimal points, because sometimes what looks like a cost-saving on paper manifest as a lost revenue down the road. So the next time you’re trying to decide whether to use your agency (or hire one) for a project, don’t forget to consider those other (sometimes hidden) costs that your accounting department doesn’t see because they’re not yet on paper. Your job, after all, is to grow your business, and that means (1) focusing on what it actually does, and (2) anticipating the opportunities and pitfalls that haven’t yet been committed to the books.